Designer Appliances has a wide selection of front load and top load washers to choose from, but which is best for you? Most LG front load washers have steam options and sensors that detect cleaning, but one of these models might not be best for your lifestyle. 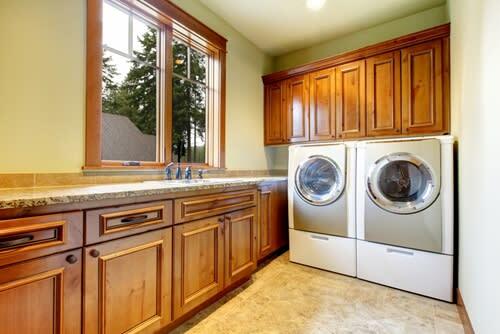 Selecting the ideal appliance will depend on how much laundry you have to do each week and who will be doing it. Here are the pros and cons to each type of washer. The most obvious advantage of having a top load washer is that you don’t need to bend over to use it. As What To Expect stated, this can be immensely helpful to parents with aching backs or expectant mothers. Removing and loading clothing into the washer is a breeze, which can be a big benefit to those who are strapped for time. Good Housekeeping magazine added that top load washers also tend to vibrate less than front load varieties, making them quieter options. That being said, top load washers don’t come without their cons. For instance, water doesn’t train easily out of these machines. This means that your clothing will be soaked once you need to toss it into the dryer, translating into more drying time. The size of the tub might also limit how much clothing you can place into the washer in one cycle. Front load washers are typically ideal for people who have a small amount of space – they can be stacked to conserve square footage. If you own an apartment or condominium, this might be the perfect option for you. Front load washers also tend to have more room in the barrel for clothing, which means you can wash larger loads of clothes all at once. However, it’s worth noting that wash cycles in front load washers often take longer than they do in top load varieties. Water can also get trapped inside of the machine more easily, which can cause mold and mildew to build up over time. If you’re concerned about noise, it might be best to avoid a front load washer. These machines are more likely to vibrate and cause a ruckus in your household than top load models. Once you take the pros and cons of each type into consideration, you’ll be in a better position to make a solid decision.